Sometimes the best fishing can be found in your own back yard. No extra packing, planning or plane trips. Just pure and simple fun. This morning I got up early and secured the kayak on the rack using 2 bungees. The one-mile trip on backroads to the local mill pond would be quick and the speedometer would never reach 30 mph. 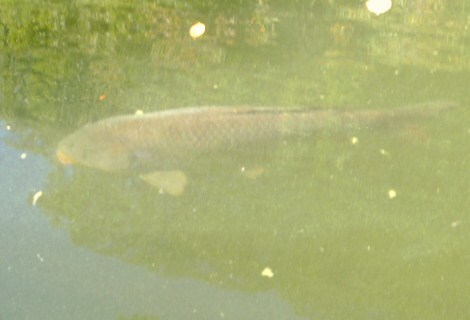 I had not visited the pond since the spring, and was eager to see how it would fish. My weapon of choice was the 7′ 4″ fiberglass 4wt that I built earlier this year. You can’t beat the flexibility of fiberglass, and the softer presentation helps smoothe the delivery of otherwise clumsy poppers. The close maneuvering to the kayak that is needed during the release is also more comfortable with fiberglass. When I arrived the sun was not yet over the trees. There was plenty of glassy water, most of it covered in shade, with just enough vegetation to form some interesting fishable pockets. I was told that there were bass in this pond, but up until today I had yet to catch one. 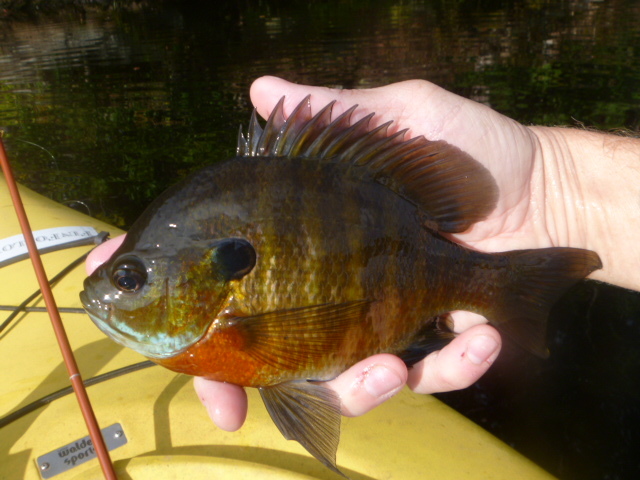 Early on I hooked this guy, who circled the kayak and pulled hard enough to remind me that he was not a bluegill. There were also a number of healthy bream caught, most of them larger than my hand. Almost all were found in water not more than 4 feet from the bank. This was one of the more colorful characters. If you’re like me and often just have a couple of hours to spare, use Google maps to explore some local blue lines and shapes. Enjoy! Fall in Connecticut is one of my favorite times to fish. Daily highs drop into the 70’s. The air is crisp with light winds. Fishing pressure drops as some anglers turn their sights (pun intended) to hunting. Today was one of those perfect days. Highs in the mid-70s, sunny and little competition for the water. 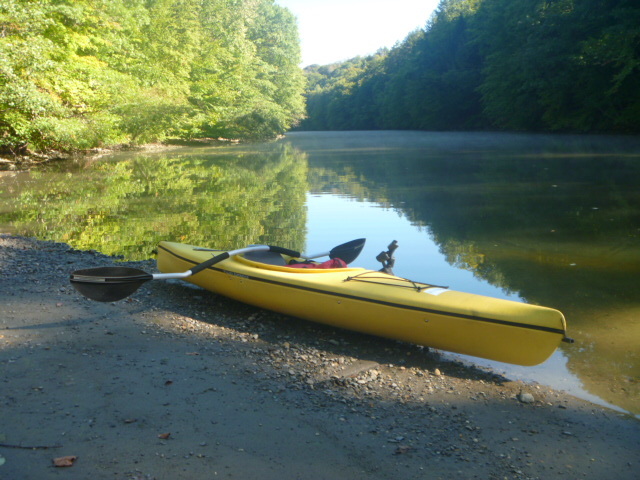 I chose to load up the kayak and head for a canal that feeds the Housatonic River. I arrived shortly after 9 am, quickly unloaded and rigged up. Within minutes I was casting towards the shady bank, watching the water swirl and rise around the popper before it disappeared and my line went tight. Caught quite a few of these during my 3-hour tour. Today I used poppers exclusively. No one color stood out. Green, orange, black and fluorescent yellow were all eagerly accepted. When I heard heavy splashing and saw the water churning in front of me, I assumed it was bass. As I got closer I found these guys. Needless to say, I did not go after them with a 4wt. They were 2-3 ft in length and showed little concern for my kayak as they swam by. Too big to catch on a 4wt. He was over 2′ long. 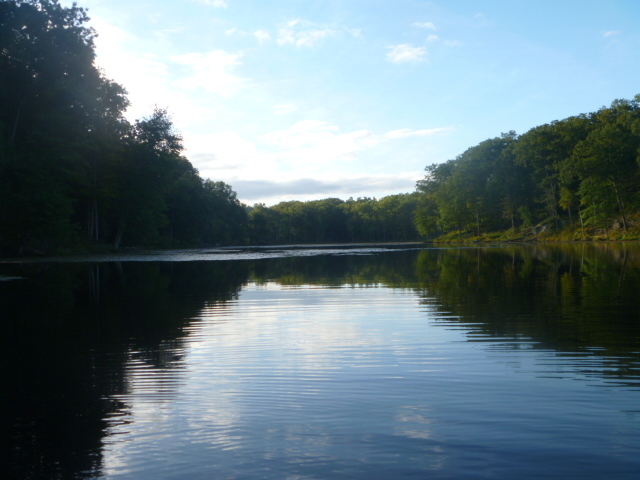 Hope you’re finding some time to get out and fish in this perfect weather. Enjoy! 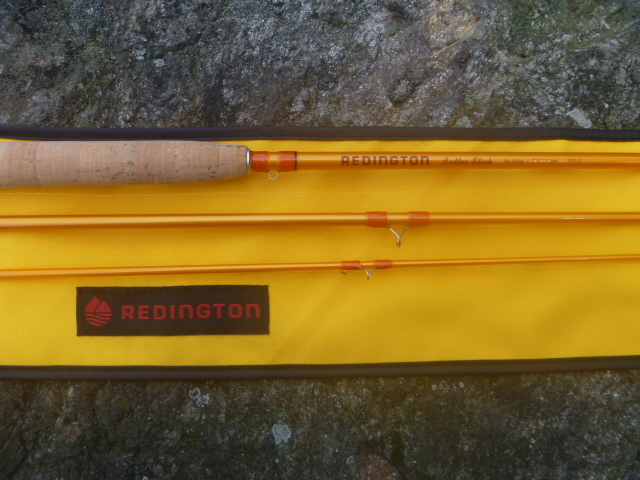 Had a chance to review one of Redington’s latest offerings, the Butter Stick fiberglass fly rod. I enjoy making and fishing fiberglass rods, so when I saw the press release a couple of months ago I immediately put my name in the hat to test it. To see the company web site and get more info on the Butter Stick click here. I chose the 7′ 3wt matched with the Sage Click III reel and RIO fly line that I reviewed in this post. Turned out to be a good choice. The Click III is lightweight and helped make a well-balanced combo. One of the first things I noticed was the bright yellow blank with wraps of a color I refer to as safety orange. The rod looked like fun before I ever put it together. The color choice obviously inspired the name, but visually it’s a nice departure from the more common green/brown/blue palette of fly rod blanks. There are also some subtle touches, such as alignment dots. 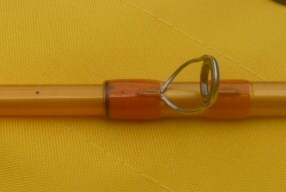 The rod also comes with a bright yellow fabric rod bag, and brown rod tube. The lifetime warranty is also a plus. When it comes to the reel seat, I would’ve preferred the uplocking reel seat version to the sliding rings, but they worked fine with the Click III reel. The weight was also a surprise. Only a spry 2.1 oz., The $250 price tag is also reasonable. 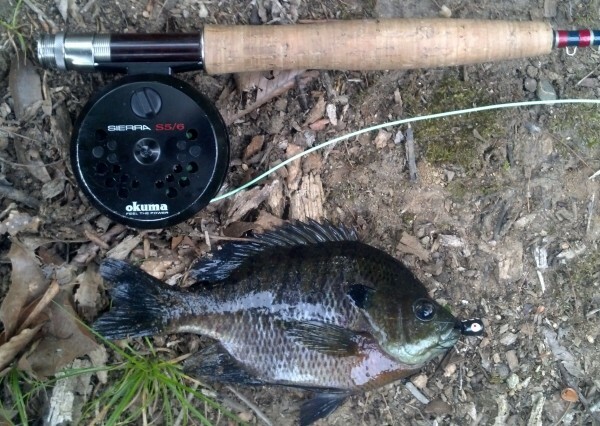 For comparison, a 7′ 3wt. Scott fiberglass rod also weighs about 2 oz. and costs $645. The Cabelas fiberglass CGT is is about $100 less than than the Butter Stick, but weighs almost 3 oz. Hardy’s 7′ 3wt. glass rod is also 3 oz, and costs $375. It only comes in a 2-piece. The most common comparison I hear is the Butter Stick vs. the Eagle Claw Featherlight. The color makes it inevitable, but this isn’t an apples-to-apples comparison. 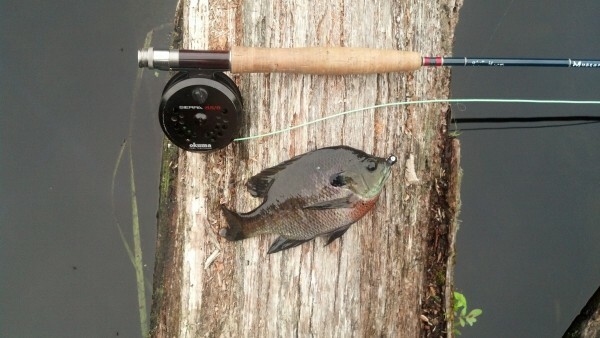 While I could not find the weight of the Featherlight, the 7′ is a 5/6 weight, not a 3wt. The Eagle Claw is also a 2-piece. I’m fan of the Featherlight as a beginner’s rod, but it has a very different look, feel and casting capability than the Butter Stick. 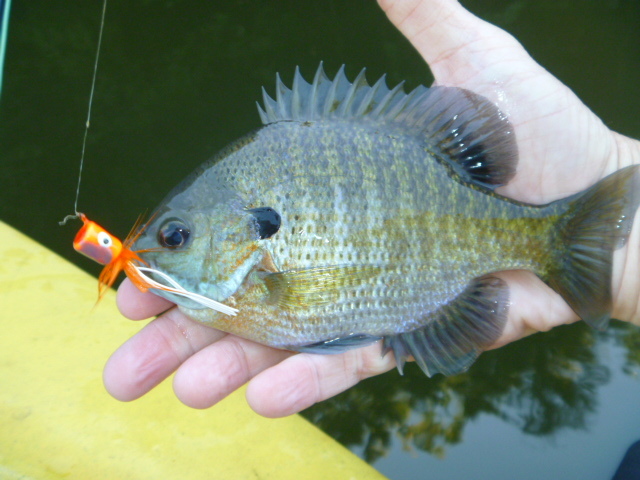 Since casting speed and general performance are often subjective assessments, my comments are based on the performance of the rod at a local bluegill pond and on the Farmington and Pootatuck rivers. Your mileage may vary. 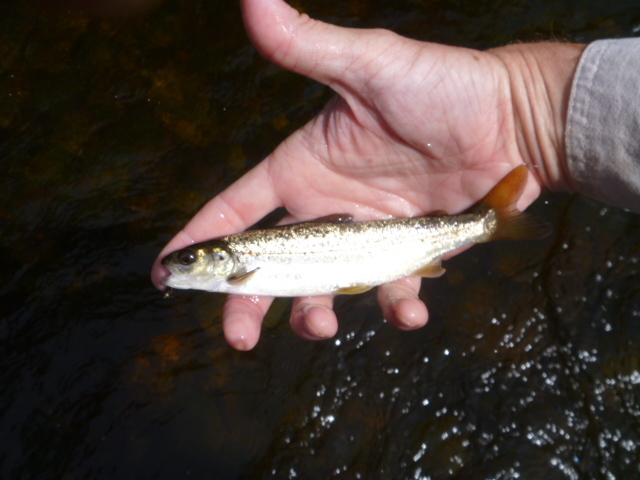 The Butter Stick may be seen by many as a small stream rod, but it is also a decent caster. It performed better for me on longer casts of over 40′ vs. those that were 30 ft. and under. It wasn’t that the close-in performance was bad, but rather the distance casting was a nice surprise. As you would expect with fiberglass, it has a softer presentation. This really came in handy for fishing around boulders, small riffles and over a glassy pond. I used dry flies, nymphs and small poppers depending on my needs and found the Butter Stick to perform solidly. As far as the action, I will agree with the others that say it is on the faster side of fiberglass performance. At times it felt more like graphite than vintage fiberglass. That said, I ran into some bass that bent the rod over double – something I couldn’t have done with a comparable graphite rod. The press release says “The buttery smooth, classic action rods in this family harken to simpler, more carefree times and help put good old-fashion fun back into fly fishing.” I couldn’t agree more. The bottom line: If you’re looking for a nice fiberglass 3 wt. that won’t break the bank, the Butter Stick is a great choice. Enjoy! 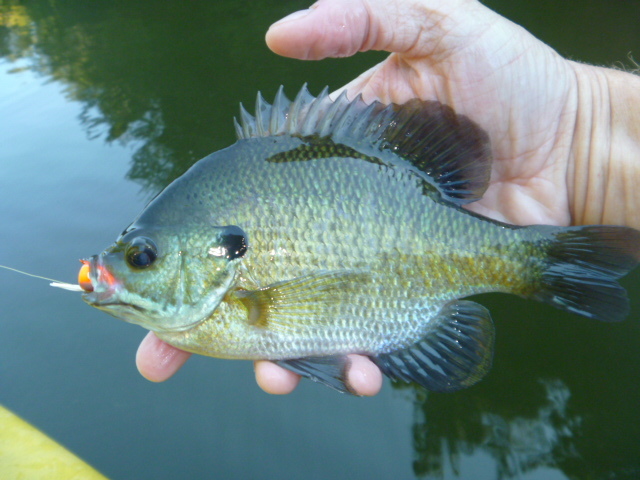 Spent an hour on the local pond, picking up bream with small balsa poppers. 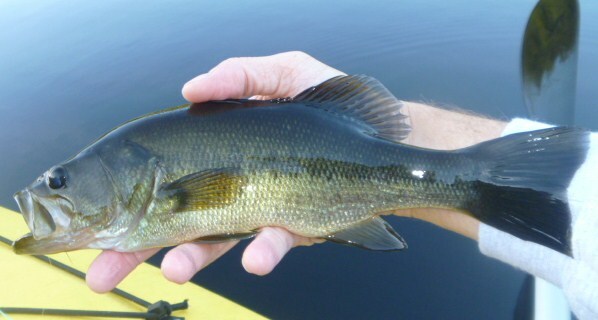 Almost every cast yielded a fish, including some small bass. Today’s preferred color was black. I’m always amazed at the range of colors on these fish. Most of my casting is made from the steep side of the shoreline, carefully avoiding the grass and surface cover, not to mention the branches and brush behind me. There is one rather unique opportunity to move away from the shoreline and extend my casting range. 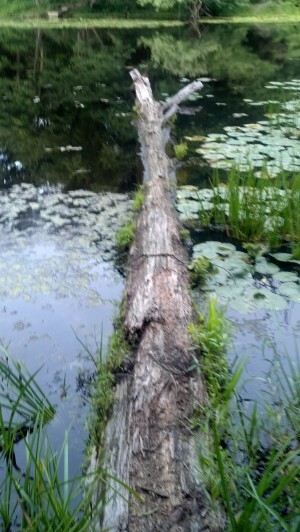 A fallen tree that reaches past the lily pads out into the pond. It has proven on more than one occasion to be a reliable casting platform. Measuring 18″ wide in most places and worn down over time by the feet of other anglers, it allows me to cast from a spot that is 15 feet from shore, providing access to open water and often bigger fish. I’ve learned to walk slowly and deliberately to the end, place my feet firmly and launch a progressive series of casts across the glassy surface. 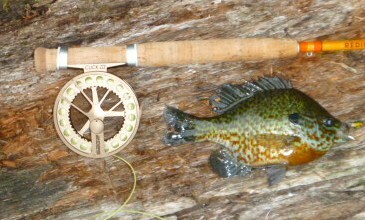 Often the popper is struck before the first twitch. This time I also used the fallen tree to improve my distance casting. Freed from the hassle of getting tangled in a branch or bush, I worked on both accuracy and delivery. My popper presentation has never been as smooth as it is with dry flies. This impromptu practice session allowed me to examine and adjust my timing and speed. By the end of the night I had reduced the size of the landing splash and improved the range. Hope you’re getting out to fish as summer ends and fall approaches. Enjoy!